Green Book, a civil rights-era comedy and drama, made history Sunday night, taking home the prize for Best Picture at the 91st Academy Awards. Why it matters: Voters weren't yet ready to hand over the top award to Netflix, which mounted a reported $25-30 million public relations campaign for its black-and-white foreign-language film "Roma." And, most importantly, the night also saw a host of historic wins for minorities at the awards. Wins for "Green Book" and "BlacKkKlansman," which saw Spike Lee finally score an Oscar for adapted screenplay, highlighted the power of race relations at the box office, despite the fact that the former faced numerous controversies and criticisms during its campaign. Two categories saw African-American women win for the first time. Hannah Beachler and Ruth E. Carter took home the prize for production design and costume design, respectively. 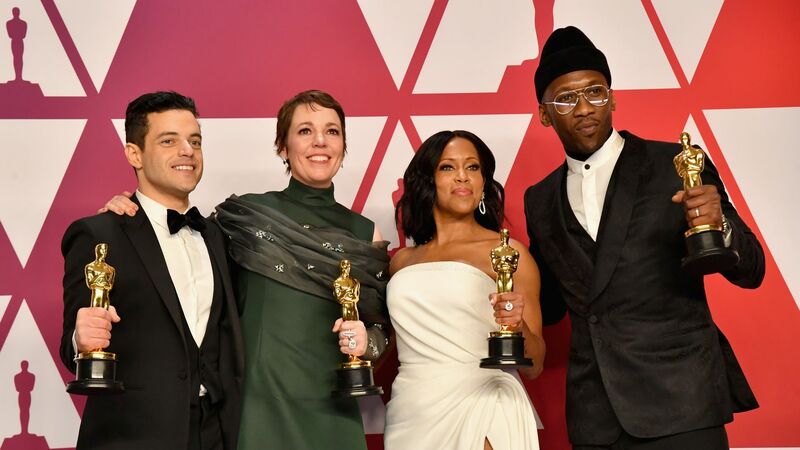 Regina King and Mahershala Ali, both African-American, took home the awards for Best Supporting Actress and Actor. "Black Panther," the first major superhero movie with an African-American lead, scored three awards. "Bohemian Rhapsody" star Rami Malek, a first-generation American born to Egyptian immigrants, won for Best Actor for playing Queen's Freddie Mercury. The film took home the most awards of the night with four wins. The big picture: Despite a ceremony without a host, the show went off relatively smoothly, proving that an emcee may not be as crucial to produce a well-coordinated show is with no major gaffes. What's next? If ad breaks are any sign of the future, then Netflix won't be giving up on its movie dreams despite the Best Picture snub. Netflix — and streaming rival Disney — both previewed their next big projects during commercial breaks with ads for "The Irishman" and "The Lion King."